Seed bead is a generic term that crafters use to refer to any tiny bead ranging in size from under a millimeter to several millimeters. Seed beads are extremely versatile; they can be used to create countless different jewelry designs, from simple necklaces to more involved projects. Try your hand at these two seed bead jewelry designs to get started. 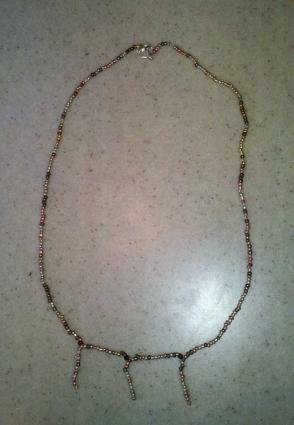 This simple, lightweight necklace can be done in any combination or size of seed bead. To make it unique, mix in a few different sizes or colors randomly as you thread. Unravel approximately two feet of jewelry thread and tie off one end. You want a long thread to start with to give you enough to work with as you back thread the beads. Slide five to six inches of seed beads onto the thread. 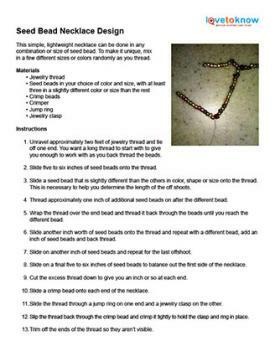 Slide a seed bead that is slightly different than the others in color, shape or size onto the thread. This is necessary to help you determine the length of the off shoots. Thread approximately one inch of additional seed beads on after the different bead. Wrap the thread over the end bead and thread it back through the beads until you reach the different bead. Slide another inch worth of seed beads onto the thread and repeat with a different bead, add an inch of seed beads and back thread. Slide on another inch of seed beads and repeat for the last offshoot. 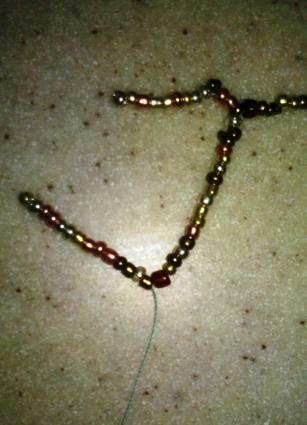 Slide on a final five to six inches of seed beads to balance out the first side of the necklace. Cut the excess thread down to give you an inch or so at each end. Slide a crimp bead onto each end of the necklace. 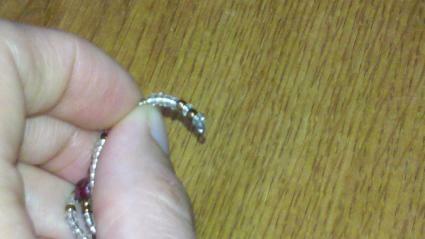 Slide the thread through a jump ring on one end and a jewelry clasp on the other. Slip the thread back through the crimp bead and crimp it tightly to hold the clasp and ring in place. Trim off the ends of the thread so they aren't visible. 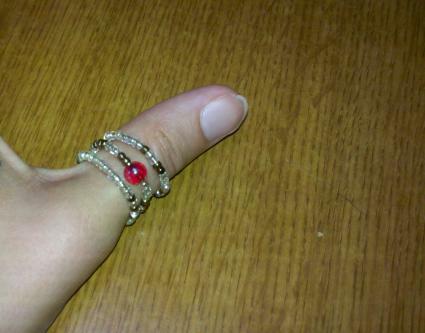 Make this fun, flexible ring that will fit any size finger. For the center bead choose either a solid-colored bead, or something more decorative that complements the seed bead colors. Measure out approximately 3 inches of wire and cut to size. Grasp one end of the wire with the pliers and twist it firmly down onto itself to form a small loop that closes the end of the wire. Slip seed beads onto the wire until you reach the midway point. Place a larger or decorative bead onto the wire. Continue filling in the wire with seed beads until you reach the end. Grasp the end of the wire with the pliers and bend the point down onto itself to close the other end of the wire. 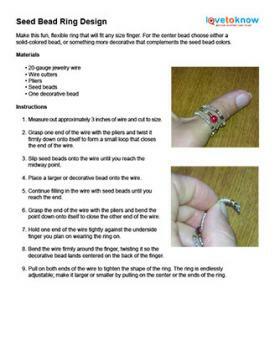 Hold one end of the wire tightly against the underside finger you plan on wearing the ring on. Bend the wire firmly around the finger, twisting it so the decorative bead lands centered on the back of the finger. Pull on both ends of the wire to tighten the shape of the ring. The ring is endlessly adjustable; make it larger or smaller by pulling on the center or the ends of the ring. To download the patterns for both of these seed bead projects, click on the pattern you would like. If you need help downloading the printable instructions, check out these helpful tips. Click to download the necklace pattern. Click to download the ring pattern. Seed beads are fun, versatile and a great way to add a little sparkle to any jewelry project. Get comfortable working with them with these two projects, then use them as a jumping off point to a creative design of your own.